Featuring TribridHot, the 600D is highly adaptable. It uses engine heat when driving, AC electric when connected to shore power or a low emissions diesel burner when dry camping—the XV-HD carries an astounding 115 gallons of diesel fuel. On chilly mornings, it'll preheat the engine. 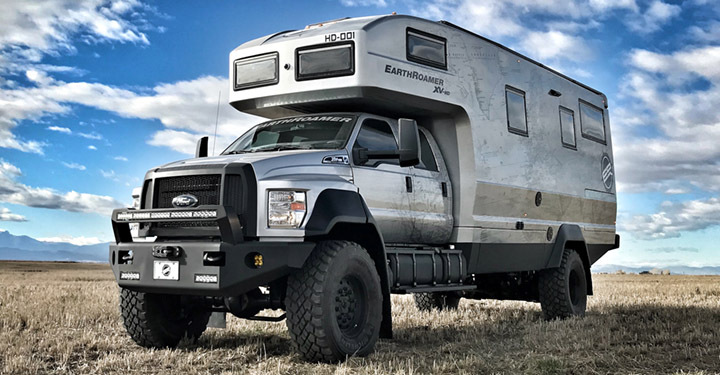 Unlike anything on or off the road, the fully custom EarthRoamer XV-HD is built on a heavy-duty 4WD Ford F-750 chassis with a 6.7L V8 turbo diesel engine. Its well-appointed interior is a tasteful blend of natural colors and textures that is at home in Moab, Utah as it is Dakar, Senegal. EarthRoamer is the world's leading designer and manufacturer of 4WD luxury expedition vehicles. Its website is www.earthroamer.com.